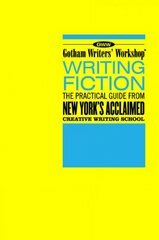 Writing Fiction 1 Edition Gotham Writers' Workshop has mastered the art of teaching the craft of writing in a way that is practical, accessible, and entertaining. Now the techniques of this renowned school are available in this book. Here you'll find: - The fundamental elements of fiction craft-character, plot, point of view, etc.-explained clearly and completely - Key concepts illustrated with passages from great works of fiction - The complete text of "Cathedral" by Raymond Carver-a masterpiece of contemporary short fiction that is analyzed throughout the book - Exercises that let you immediately apply what you learn to your own writingWritten by Gotham Writers' Workshop expert instructors and edited by Dean of Faculty Alexander Steele, Writing Fiction offers the same methods and exercises that have earned the school international acclaim. Once you've read-and written-your way through this book, you'll have a command of craft that will enable you to turn your ideas into effective short stories and novels. You will be a writer.